The Super Letter Locker was designed using a variety of qualities from existing Letter Locker products. 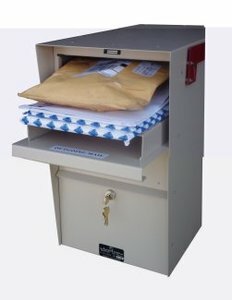 With the additional 4” in length and a rotating hopper door, the Super model provides superior security in mailboxes. Standard Features: Rotating Hopper Door. Made of durable 14 and 16 gauge steel. Will hold up to 2 weeks of mail. Accepts large envelopes and small packages. Stainless steel red flag. Powder coat finish available in Black, White, Grey, Tan and Bronze.